Another day dawns, and we pack the Landrover and cruise. Head back to Grindavik for fuel and water and after some confusion in the complex road system in Grindavik we head off east for Porslarhöfn. All appeared to be going well until….. I noticed that dashboard lights were indicating that the lights were not working. Oh well, even though it is compulsory to drive in Iceland with your front lights on, I doubt we will get stopped. Andy was driving and noticed a more serious problem. The engine revs suddenly went up, and the Landrover speed went down. We have got ourselves a powertrain failure. Andy also reported a sudden loss of brakes too. We glided to a halt and we lept out to take a look to see if we could identify the problem. For once, the problem of diagnosis was extremely short. Our Series IIA Landrover had obviously got a bit bored with being a 4 wheel model and opted to join the 3 wheel Landrover camp. The read on-side bearing had failed, turning into a pile of grindings, and the rear wheel, still attached to the half shaft had nearly left company with the vehicle. 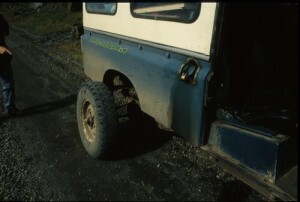 We jacked and propped up the damaged side of the Landrover for a closer inspection. The bearing was a real mess, probably as a result of the rear axle still being full of bits of half shaft from the earlier problems on the Geithellnaá. Between our brains and the Haynes manual, we created a full list of parts needed to get going again. Although we had a good selection of parts from Alan’s Landrover Spares of Sheffield, we did not have the casting on the end of the rear axle, and we had used the spare rear half shaft on the on side. The offside half shaft is a different length so they are not interchangeable. I was picked for the parts collecting trip, so I set off with the magic thumb towards Reykjavík. The first lift was from a group of talkative Americans in a Jeep. They went on ad-nauseum about things I was ill equipped to comment on and I was glad to get out at Route 1. The next lift took me directly to my friends house in ﻿Reykjavík. 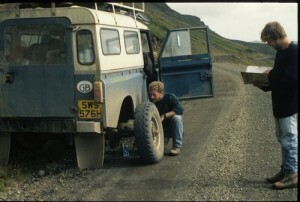 Hitch hiking in Iceland in 1991 really is pretty good if there are cars about. My friend was at work, but managed to skive off, and we bought a new rear bearing for £40. Not too bad so far. The scheme for getting the rest of the parts was to visit an uncle of my friend who had a farm over at Hella, where they have a dead Landrover in a field. There was no time to do that today, so we went to bed and will set off in the morning.